Canadian Olympic gold medalist Hayley Wickenheiser of Shaunavon, Saskatchewan is being inducted into the International Ice Hockey Federation Hall of Fame. In a remarkable women’s hockey career, Wickenheiser had 168 goals and 211 assists for 379 points in 276 games for Team Canada. This is the first of what is expected to be many hall of fames Wickenheiser will be inducted in. She has already received the honorary doctor of laws from five Canadian universities, has her star on Canada’s Walk of Fame and is a member of the Order of Canada. Wickenheiser is one of five people to be inducted in 2019. The other four are Mike Modano, Zigmud Palffy, Miroslav Satan and Jorgen Jonsson. Of the four men’s hockey players, three have a Canadian connection. Modano played for the Prince Albert Raiders of the Western Hockey League, Jonsson was drafted in the ninth round, 227th overall by the Calgary Flames in the 1994 National Hockey League Entry Draft, and Satan played two seasons for the Edmonton Oilers. 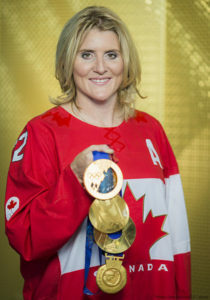 Wickenheiser was one of three Canadian women to win four gold medals in women’s hockey at the Olympic Winter Games. The others are Jayna Hefford of Trenton, Ontario and Caroline Ouellette of Montreal, Quebec. She won gold at the 2002 Olympic Winter Games in Salt Lake City, the 2006 Olympic Winter Games in Turin, the 2010 Olympic Winter Games in Vancouver and the 2014 Olympic Winrer Games in Sochi. Wickenheiser becomes the fourth Canadian woman to be inducted into the International Ice Hockey Hall of Fame in Toronto. The other three are Angela James of Toronto, Ontario (2008), Geraldine Heaney of Toronto, Ontario (2008) and Danielle Goyette of Saint-Nazaire, Quebec (2013). Wickenheiser will be honoured at the 2019 World Men’s Ice Hockey Championship in Bratislava, Slovakia.